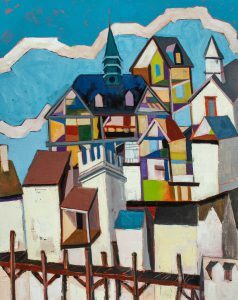 Provincetown, MA: The Alden Gallery will present a two-person show of new work by Paul Kelly and Mike Wright, opening on Friday, July 27, 2018, from 7 to 9 p.m., at the gallery’s exhibit space at 423 Commercial St. Drinks and refreshments will be served; the gallery is open to the public and free. The show will be on view through August 9. 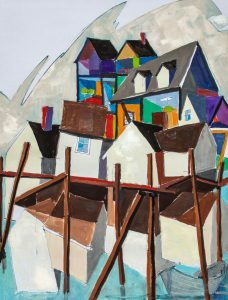 Mike Wright, a Provincetown artist who has for decades been creating sculpture made of painted wood she has found locally, returned to the Provincetown fishing fleet for inspiration for her new show at the Alden Gallery. 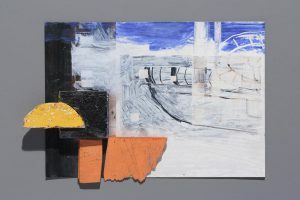 “This new work is about lost vessels and boats, and even more so about found ones, but still fundamentally about structure, form and color,” she says. “I’ve always used found materials in my work, and this time I came across a box of postcard announcements of my past exhibitions. I covered the postcards with oil stick color, then scratched and scraped to reveal some of the photographic images of my sculpture underneath. Finally, I attached bits of found painted wood to the artwork for a three-dimensional effect. 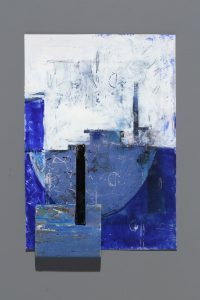 By appropriating the images of my art on the postcards, I was able to make a connection between past work and current practice.” Wright has received a Pollock-Krasner Foundation Grant, an Artist’s Residency Award at the Vermont Studio Center, and has had solo shows of her work at Provincetown Art Association and Museum and the Cape Cod Museum of Art.